Barn cats PURRR up in the hayloft. Between the rafters, pigeons COO. Do you want to hear their secret? PSST! Guess what? It’s I LOVE YOU! This sweet addition to our successful Snuggle Time Stories series celebrates the love between parents and children of every species. In lilting rhyme, the book introduces toddlers to an array of super-adorable animal parents and babies—including cows, horses, sheep, cats, owls, ducks, roosters, and, of course humans. What do they all say to each other? I LOVE YOU! This is the perfect read-aloud and goodnight story. 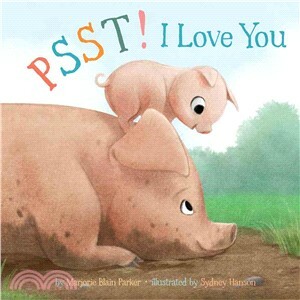 Marjorie Blain Parker has written many picture books, including I Love You Near and Far (Sterling), When Dads Don’t Grow Up (Dial Books for Young Readers), Hello, School Bus! (Scholastic), and Mama’s Little Duckling (Dutton Children's Books), which School Library Journal called "a standout." Check out more of Marjorie's work at marjorieblainparker.com. She lives in Denver, CO.
Sydney Hanson’s picture books include D Is for Duck Calls (by Kay Robertson, the matriarch of the Robertson family and star of?A&ER’s?Duck DynastyR), and Next to You: A Book of Adorableness (Whitman, 2016). In addition to her traditional illustrations, Sydney is an experienced 2D and 3D production artist who has worked for several animation shops including Nickelodeon and Disney Interactive. Sydney lives in Glendale, CA.